So I recently joined the Facebook Group British Nail Bloggers who regularly do a 'Ask A British Nail Blogger' challenge. This weeks is rather tricky for me, and asks what the oldest polish in our collection is. Now some of you may know this, but before starting my blog I had really only been into nail polish for around 8 months, so very nearly a year now! Before then I wasn't allowed to wear nail polish in my various student supermarket jobs so I tended not to bother. I do remember way back when I was around 14 I had a metallic turquoise from Avon which made me feel so rock n roll and I wore it so often haha! Such a drastic change to my opinion on polish now! When I got into nail polish last year I went into Superdrug and bought the basics: A Rimmel Red and Turquoise, Barry M gold glitterish, and two Andrea Fullerton nail art pens in silver and black. I did so much nail art with these basic supplies and slowly my polish stash began to grow with items from Boots, Superdrug and Asda. How times have changed. Towards the end of last year I got into reading blogs a lot more regularly. I had read some in passing for nail art ideas and tutorials (the Nailasaurous was always the one I ended up coming back to - even though I didn't realise it was the same blog!) but before then I had no idea of the scale of the nail blogger community and neither had I heard if the professional brands. Slowly I became more envious of these interesting brands and their fabulous names and I looked into it. In January I treated myself to my first ever batch of China Glazes in a job lot on ebay, as well as the two colours I decided I wanted to be my welcome mat into the world of professional polish - Ruby Pumps and Dorothy Who. Here is my first China Glaze batch: Thataway, Tantalise Me, Grape Juice, Towel Boy Toy and Afterglow. 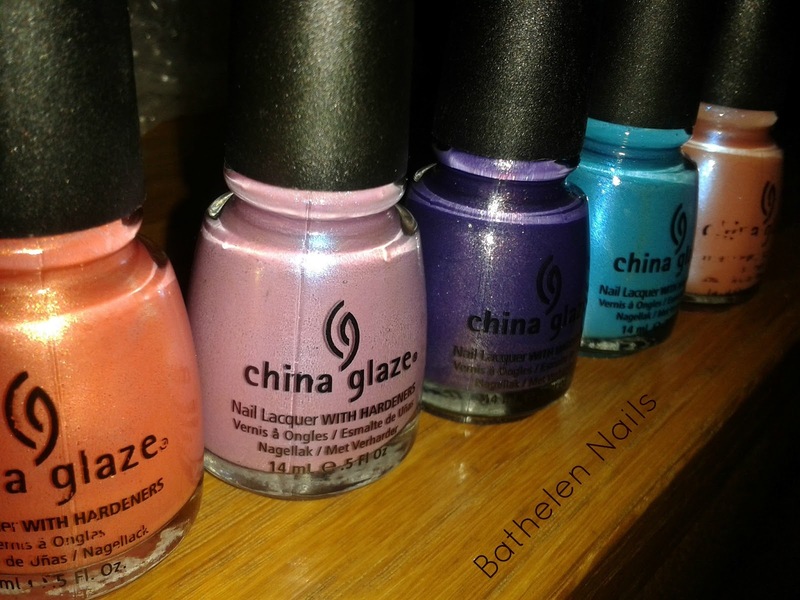 I've come a long way since I bought these polishes, starting a blog not long after this to chart my progress and my ever growing stash and also so that I could meet people who would also get as excited about a China Glaze delivery as I do. And for this reason I want to thank all of you - my regular readers and followers, the ladies in the BNB group and the bloggers who have continued to inspire me! I would not still be writing this without the encouragement I began receiving almost immediately! You are all fabulous. Great post. Loved reading your history! It's fascinating finding out how other people got into nail polish and nail art, especially someone new to it all like myself. I found my way to China Glaze and OPI via the sale shelf in Sally's.